More businesses are seeing the benefits of hiring remote workers, whether it’s to save money, increase performance or to reach out to more experienced staff. Whatever the reason, organizational and communication skills are very important. At Abodoo, we like to look at the different software on the market that can benefit home-workers and businesses. This week, we’re showcasing Trello, the web-based app that helps you manage all your business tasks. Trello was developed in Toyota as a system to keep production levels high and maintain flexibility. The task management app is not only free for individuals, but it offers a simple and easy to use task management board that allows you to visualize your work easily and move tasks from different boards to different people- dependent on who the task is assigned to. 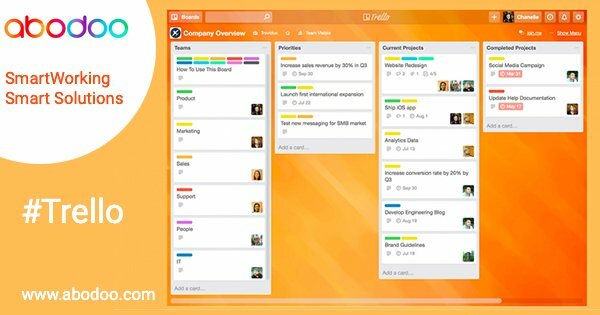 Trello is a system of boards, lists, and cards. This creates a system that allows for individuals or teams to track a project and collaborate or contribute where they can be most useful or where it is most needed. At Abodoo, many of the team use Trello, whether it’s to manage their individual work or for collaborative projects. It’s a great way to communicate and by downloading it onto your desktop, it can become a very important task manager that works brilliantly for many people. Looking for home working roles or are you a business looking for remote workers? See how Abodoo can help you, find instant matches based on your skills to help you find your perfect role. Click here to learn more.